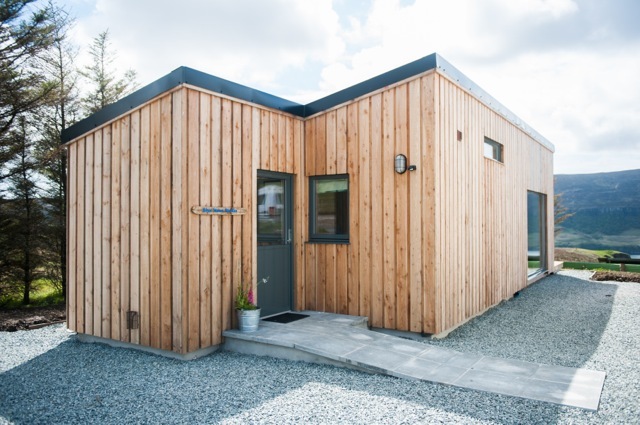 Our new, detached studio apartment for two adults, is in a superb location at the head of Lochbay on the beautiful Waternish peninsular, in the magical, north- west of Skye. 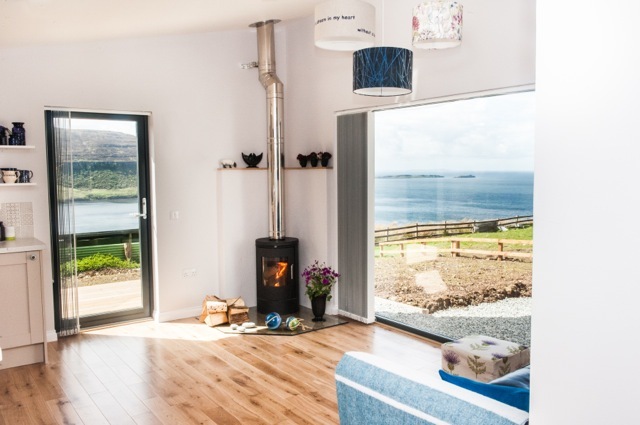 From the huge window you will look out out across miles of sea and islands to the Outer Hebrides beyond. Blue Moon Studio is open plan in design, has a quirky vibe; funky textiles and local artworks – an interior a wee dash out of the ordinary which we hope will help to make your holiday that little bit special. 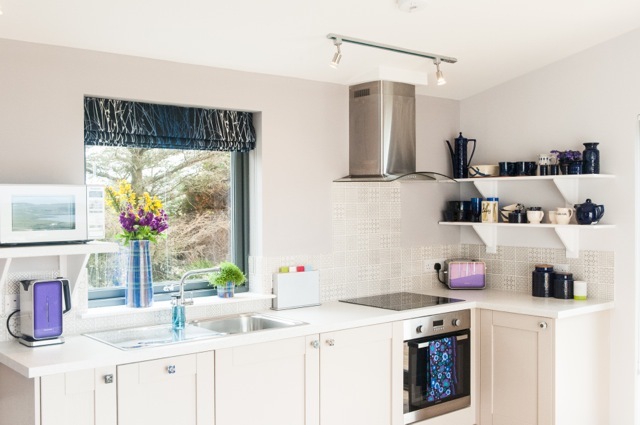 From its fantastic cliff top location, Blue Moon Studio, looks down on the whitewashed cottages of the fishing village of Stein, which means that you’re not far from the island’s oldest inn and fabulous food at the Michael Smith’s ‘Lochbay Restaurant’. 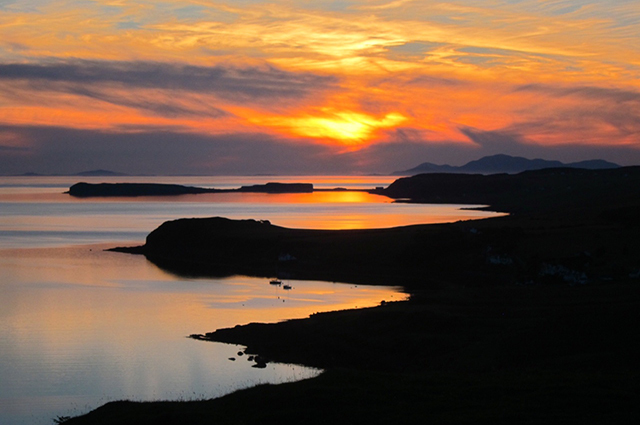 Waternish is also famous for it’s fabulous sunsets; travellers tell us they are the best in the world and there is no better vantage point than the deck of the studio. Golden eagles and the majestic sea eagles are regular visitors to the skies above the cliff. More than anything, though, it is the constantly changing light on the water, be it sunlight or moonlight, which is the real star of the show. To ensure that you will be snug and cosy any time of year we have a log burning stove, with ample logs so you can sit and watch the weather sweep across the bay. Equipped with the conveniences of modern life, we’ve tried to combine luxury with practicality so that you feel immediately at home in our clean, fresh, studio apartment. Due to the close proximity of sheep and out of respect for our local crofter, unfortunately, we regret we are not able to accommodate dogs. Blue Moon Studio is for two adults only. Terms and conditions © 2015 Blue Moon Studio.